I love salad. Real salad, not the boxed mixed greens kind of salad, but the kind of salad you need a fork AND a knife to eat. That’s what I’m talking about. The kind of salad that actually gets better in your fridge overnight. The kind of salad that gives you more vegetables in one sitting than you had the entire day before. It can take a little bit more effort to make, but it will feed you for days with its flavonoid-filled enthusiasm. I grew up on various versions of this particular one. It magically popped up around asparagus season (my awesome Mom being the magician), and versions of it were either on our dinner table or in our refrigerator throughout the summer. It never lasted long (I have three sisters), so I recommend you make extra if there is stiff competition for leftovers in your house. 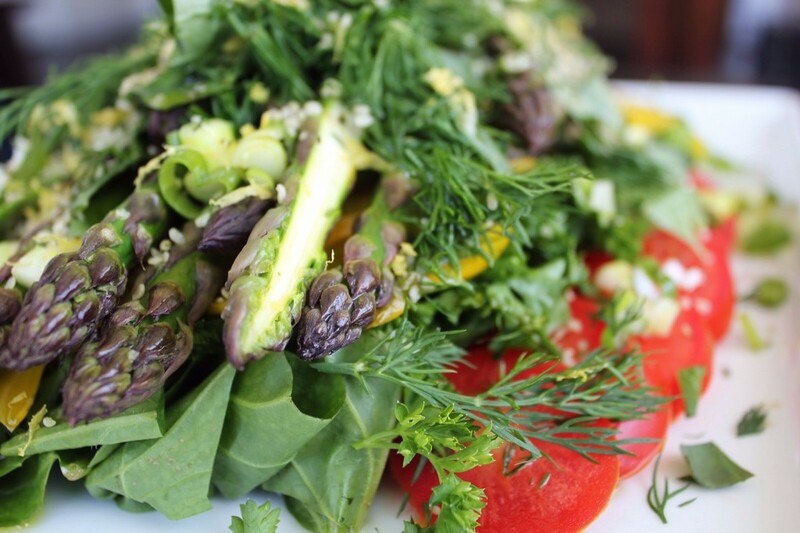 Asparagus is the star of the show in this particular salad, although it has plenty of help from some bright and bountiful supporting characters. It is cooked by a method I like to call ‘oven-steaming’, which is basically roasting with a bit of water. It allows for the tenderness of steamed vegetables, without too much water to wash away the vitamins. 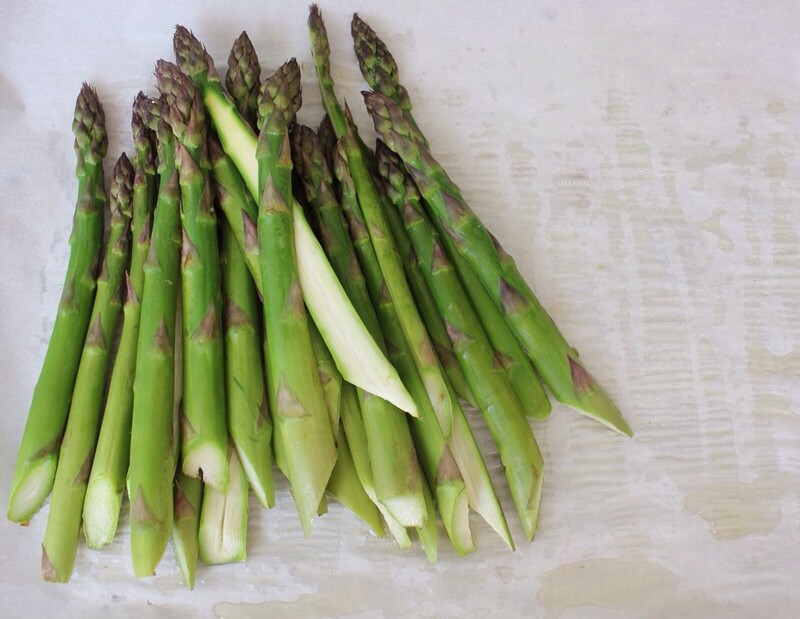 The water also prevents the asparagus from browning during the roasting process, staying far away from any carcinogenic flirtations. No shocking in an ice bath, no one likes to be shocked, and we want to keep those nutrients from washing away. This is a ‘composed’ salad, as opposed to a ‘tossed’ salad. Everything is placed and stacked on a platter, and the vinaigrette is drizzled over top. This means that varying layers of fun will be discovered by those eating it, and it also means that you can dress it beforehand, the vinaigrette acting as more of a marinade. It is perfect for taking over to a friend’s house for lunch or dinner, or just to fill their fridge with a delicious and fresh treat that is totally ready to enjoy. 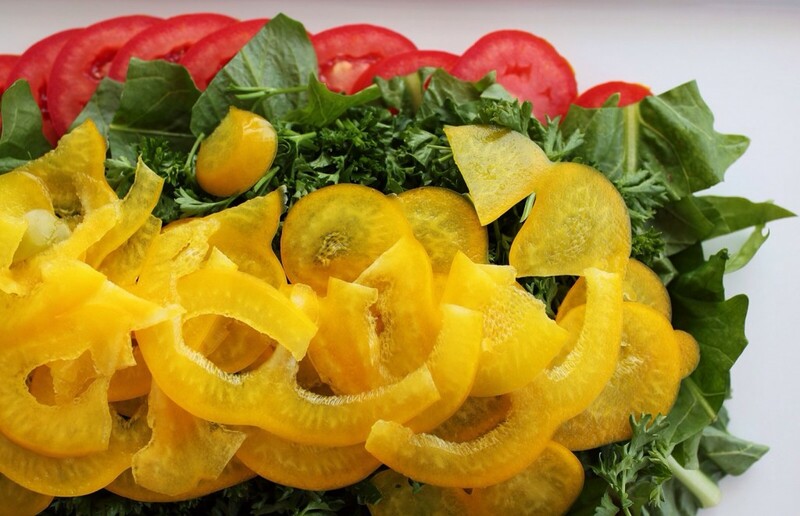 There is a layer of lettuce on the bottom between the sliced tomatoes –I used dandelion greens but anything with a bit of body would be great. A layer of fluffy curly parsley goes down on top of that –I know Italian parsley is the cooler cousin, but the parsley afro absorbs juices and flavours like nobody’s business (just like broccoli florets! ), and I happen to like its slightly more aggressive taste and texture. Next is a layer of thinly sliced yellow peppers to add some sweetness and a new pigment to vary the nutrients (and visually, it breaks up all that green). After this, the room temp/warm, freshly oven-steamed asparagus goes on, followed by every fresh herb that you love (or have growing in your garden). In my case it is basil, dill, chives, and then sliced green onions for some extra sharpness. Top with lemon zest and a good handful of hemp hearts for some added protein, fat and another interesting texture. Pour fresh lemon juice over top, followed by some extra virgin olive oil, in approximately equal parts or heavier on the lemon. This salad can handle it. This serves 4-6 as a side dish, although 2 ambitious eaters could put a serious dent in it too. Snap or slice the ends of the asparagus off. If there are any spears that are fatter than the others, slice them in half lengthwise, so that they cook evenly. Arrange it on a parchment-lined baking sheet. Splash on a couple of tablespoons of water, and roast for 4-6 minutes at 325*F, or until bright green but still firm. 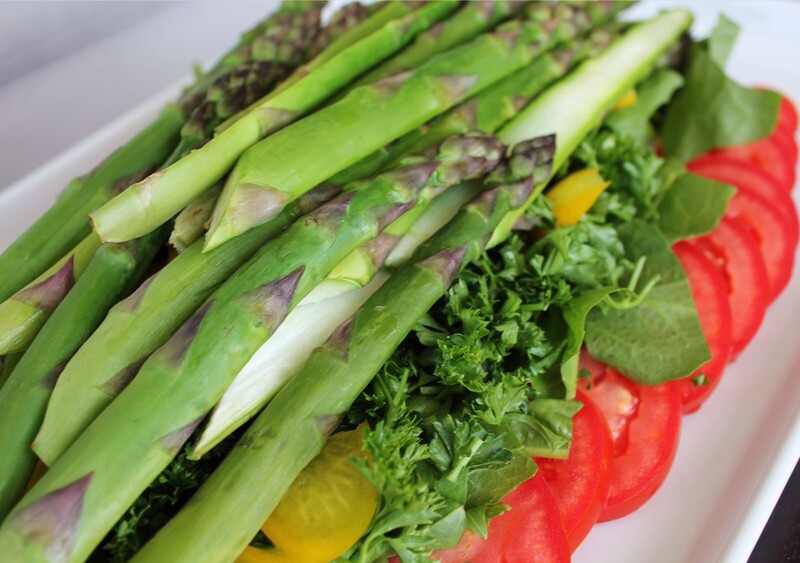 Allow it to cool until you are ready to top off your salad. Slice the tomatoes and line them on either side of the platter. This will be your border. 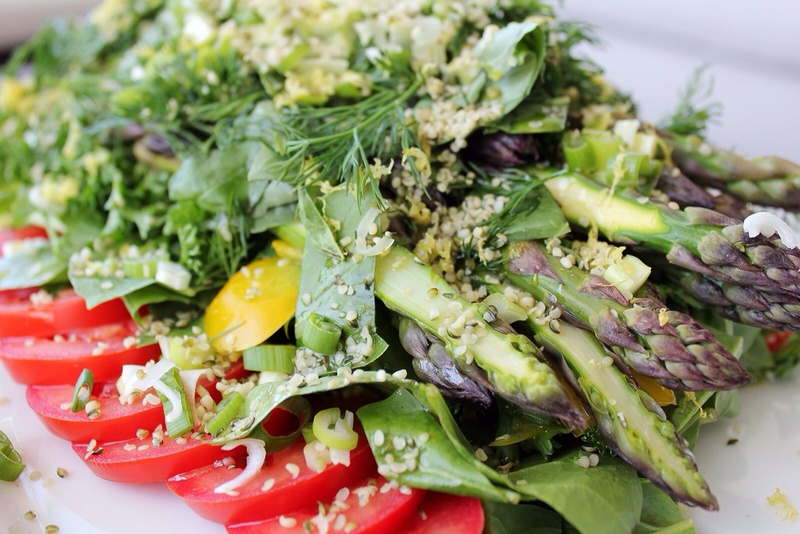 Put the dandelion greens between the tomatoes, followed by the parsley, peppers, asparagus, other herbs and green onions, hemp hearts and lemon zest. Pour all of the fresh lemon juice over top, try to drizzle it all over evenly, followed by the olive oil (lemon juice sticks better if it goes on before the oil). In place of dandelion greens -watercress, napa cabbage, kale, even spinach. 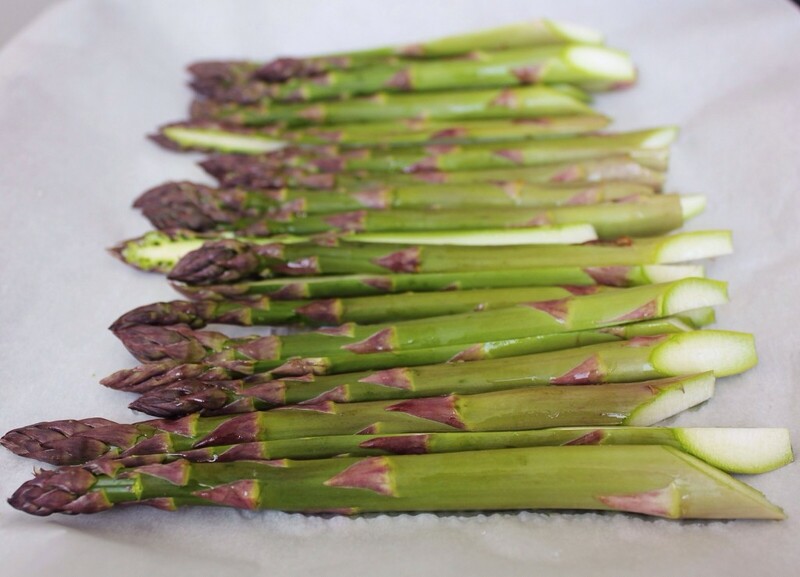 In place of asparagus –green beans or broccolini, Roast beets, squash or Brussels sprouts. In place of the sliced peppers -roast shitakes or wild ramps, grated carrot or thinly sliced or diced cucumber. 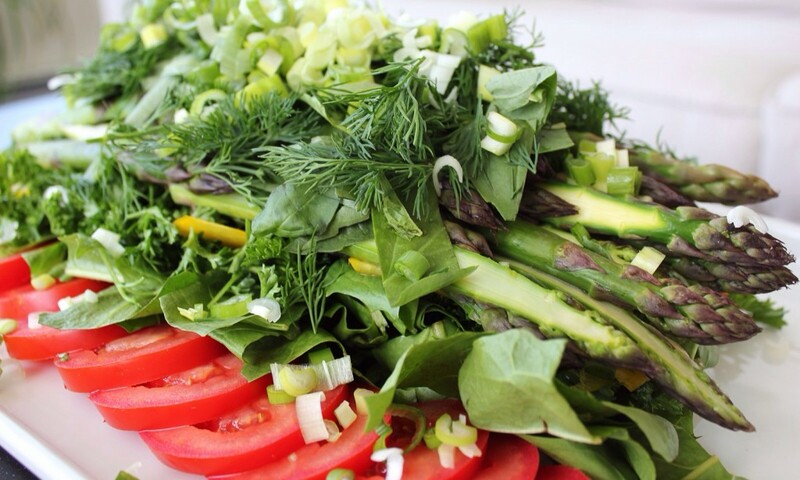 in place of any of the herbs –mint, chervil, tarragon, cilantro, sorrel –mix it up, it can change everything. In place of green onions -thinly sliced red onion or shallot. –Add avocado in place of nothing, just because it makes everything better. Be sure it’s on top so that it gets a good hit of lemon juice (for vanity reasons -you don’t want it to be all brown tomorrow when you beat your family to the fridge at lunchtime). -Throw in some cooked quinoa to make it a more substantial meal.